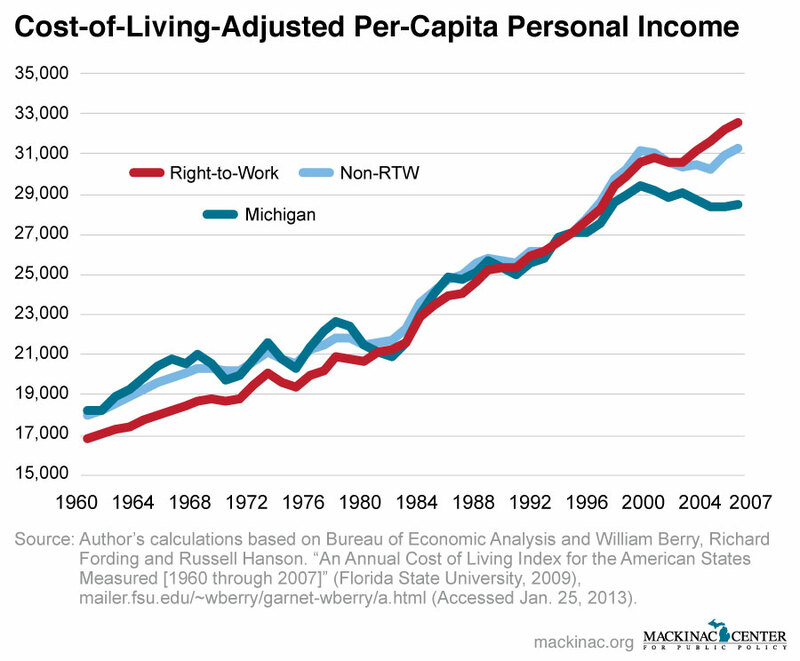 Right-to-work is about making Michigan home again. 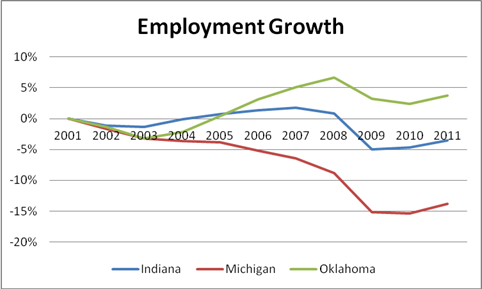 For far too long, Michiganders have left the state to find opportunity elsewhere. Over the past decade Michigan has seen a great exodus of its residents, including many of our talented graduates. Michigan’s lost too many young people to other states that have been friendlier to workers and job creators in the past decade, but right-to-work may change that. Between 2000 and 2011, right-to-work states saw an increase of 11.3 percent in residents ages 25-34, according to the Census Bureau. Forced unionism states have seen an increase of only 0.6 percent over the same time-span. People may decide to move for a variety of reasons, but economic opportunity is consistently listed as one of the most important. Nearly 5 million people moved from forced unionism states to right-to-work states between 2000 and 2009. Over 400,000 people moved from forced unionism states to right-to-work states between 2010 and 2012. That’s like the entire city of Cleveland migrating to right-to-work states in just two years. There is more opportunity in right-to-work states. In the past decade, right-to-work states added jobs while forced unionism states lost them, with a 3.5 percent increase compared to 2.6 percent decrease, respectively. It’s easier to find work in right-to-work states. The current unemployment rate in right-to-work states is 7.1 percent, compared to 8.1 percent in forced unionism states. When adjusting for cost-of-living, right-to-work states have higher incomes than forced unionism states, with 4.1 percent higher per-capita personal income. What exactly is a right-to-work law? "Right-to-Work" is a state law that prohibits employers and unions from requiring an employee to pay dues or fees to a union in order to keep his or her job. Currently, 24 states including Michigan have right-to-work laws. Does right-to-work ban unions or collective bargaining? No, right-to-work gives workers the freedom to choose to financially support or refrain from supporting a union through dues or agency fees in order to keep their job. Unions and workers can still collectively bargain over any topic in a right-to-work state as they can in a non-right-to-work state, but a union may not get a worker fired for refusing to financially support them. When did right-to-work go into effect for Michigan workers? Right-to-work went into effect March 28, 2013. Every new contract or contract that is modified or extended after that date cannot require a worker to pay a union as a condition of employment. This requirement is called a union “security clause.” If a union has a union security clause in place before March 28, workers covered by that contract will still have to pay the union until their contract expires or is modified. If you are represented by a union and would like to know more about how to exercise your rights under Michigan’s new right-to-work law please visit the Is Right-to-Work Right for Me questionnaire. What is a "free rider?" A so-called "free rider" is an insulting term used to describe a person who is covered by a union contract, whether they want to be or not, but does not pay dues or fees to the union. The problem is that a worker in a unionized shop does not have the ability to opt out of the union contract, even if they want to. According to federal and state law, when a union chooses to organize a workplace they agree to represent all workers. This gives unions a stronger voice at the bargaining table. Workers who would like to represent themselves or negotiate their own contract are unable to do so. Unions contend that free riders benefit unfairly because they do not pay for the benefits a union provides. This is not necessarily true. The real problem is that labor law can leave employees in a position where they are represented by a union they do not want. A union that provides valuable service in contract negotiating, even in right-to-work states, should have little problem earning the loyalty and dues of a vast majority of employees. What does Michigan right-to work mean for other states? Just as Indiana going right-to-work helped spur Michigan to worker freedom, the new law may impact Michigan’s neighbors. Michigan’s right-to-work law could serve as an inspiration and a warning to other states. It may inspire supporters of worker freedom in other states, and it may serve as a warning to other states that Michigan is open for business. Gov. Snyder cited interstate competition as a main reason to pass right-to-work legislation. Can the job differences between right-to-work states and non-right-to-work states be explained by geography? No, economist Thomas Holmes examined border counties in right-to-work and non-right-to-work states. He found that when crossing into the "right-to-work" county, "manufacturing's share of total employment increased by about one-third when one crosses the border." Doesn't a right-to-work law hurt incomes? No. When cost of living is factored in, workers in right-to-work states have 4.1 percent higher per-capita personal income than workers in non-right-to-work states. Do workers have more disposable income in right-to-work states? Yes. Disposable income, which is the total income of residents in an area minus income taxes, property taxes and personal licenses, is higher in right-to-work states. When accounting for the cost of living, the per capita disposable income in right-to-work states is 7.23 percent higher than in forced unionization states. Do right-to-work laws create jobs? No, right-to-work can make unions stronger. In non-right-to-work states, unions can take their members’ dues for granted and do not need to be as responsive because workers are forced to pay them. In right-to-work states, if unions want to keep members they need to prove their worth to their members thus serving them above or instead of political or bureaucratic interests. As in other businesses, competition will make unions as a whole more responsive and stronger. No. Even with right-to-work laws, unions collectively bargain for all employees and therefore enjoy the very same leverage they have in non-right-to-work states. They can still bargain over wages, benefits and working conditions. The only difference between collective bargaining in right-to-work states and non-right-to-work states is that a union cannot get a worker fired who refuses to financially support them. Will unions have what they need to be effective? If a union represents employees well and acts reasonably on other matters, there is no reason to believe that the workers it represents would refuse to support it, especially in a state like Michigan with a long tradition of union support. The Union Membership and Coverage Database indicates that at least 75 percent of workers who are covered by a union contract voluntarily join and pay dues.